Out for a fun day of offshore fishing during my days off were my friend and fellow Captain Louis from Florida, Carlos from Puerto Rico and myself. Our hope was to hook up with the Yellowfin Tuna that have been hanging around the Hannibal Bank earlier in the month. Today worked out great for me as I had 4 days off before heading offshore with clients again. We were blessed with a blue sky, crystal-clear blue water and a 1-3 foot swell pretty much of the day. With these conditions, I was confident we would enjoy ourselves even if we only caught bait. It was wonderful to be on the water to just relax, or so I thought, until the reels started to scream. With the reel screaming, I called to Carlos to fight a big Yellowfin that took our bait at the legendary Hannibal Bank. Carlos grabbed the rod and fought his fish with a full load of adrenaline and, after some time, landed the largest fish he had ever caught. On the morning ride to the marina, he had mentioned to me that he did not sleep well just thinking about landing a big Tuna on the Bank. Well, his loss of sleep wasn’t in vain. We remained on the Bank and caught one more Tuna before deciding to try our luck at “Wahoo Wonder”. I elected not to fish so that Carlos could get some extra rod-bending action in. After landing two nice Wahoo, we called it a short day and headed back to the marina. The cooperative Yellowfin and Wahoo made for a short day on the water. I wish to thank Captain Louis and Carlos for their friendship and companionship, and look forward to enjoying another day like this out on our playground with them. I totally enjoyed my days off by continuing to sport fish. Carlos with his Yellowfin Tuna!! Tuna Slam on my day off! 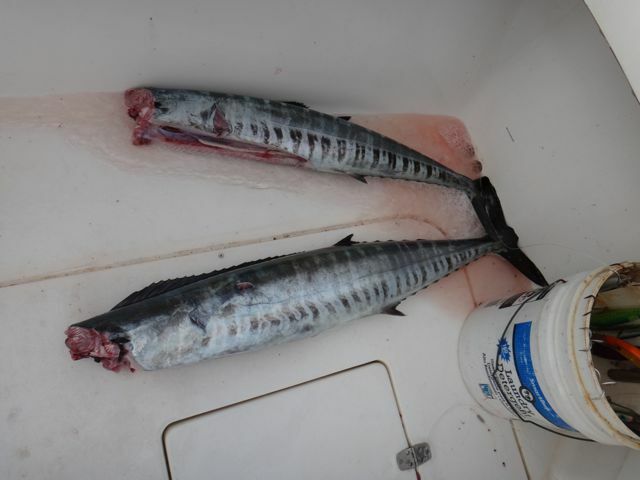 Picked up a couple Wahoo on the way home..